With an outstanding level of equipment for a production cruiser/cruiser, the First 40 has won fame for a unique international record of achievements in IRC, as well as ORC. A reference in the forty foot class, this boat does not compromise on safety and yet its level of comfort makes living on board very pleasant. Highlighted with subtle decoration and a set of black stripes on a grey hull background, the bottom is as appealing to the eye as it is sailing. The First 40 ‘Carbon Edition’ is delivered ready to race. 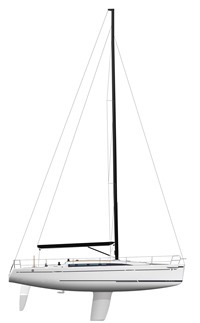 In this format she has a carbon mast, lead keel, a black composite steering wheel, and a Raymarine electronics pack adapted to regatta racing. and lowers to free space or extend the berths. Designed to lead the race, the First 40 supplements its choice of performance with solutions that provide crews with a high level of comfort. 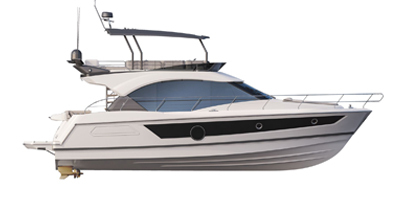 The boat can accommodate a crew of eight, offering two symmetrical aft cabins with double berths (2.00 m by 1.50 m), a master fore cabin (1.90 x 1.40 m) with shower room and two ordinary berths can be made up in the saloon. The First 40 users and spinnaker retractable carbon bow sprit making the use of an asymmetric spinnaker much simpler. Both light and strong, the equipment has been chosen for its high level of performance: carbon mast, rod rigging, fibre adjustable backstay, rigid boom vang, tilting composite steering wheel. Raymarine electronics on option, mast foot repeater on bracket. Stainless steel tilting central steering wheel. Life raft locker in cockpit bottom (width 120 cm x 110 cm x height 50 cm). Cabine avant double, deux cabines arrières symétriques couchage double. Cuisine en L permettant le calage en navigation. Cabinet de toilette avec douche. Carré : La forme et la taille des assises permettent une utilisation couchage (Longueur 1.95 m). Table de carré réglable en hauteur (option) multifonctions : - position haute pour déjeuner - position basse pour couchage ou support voiles. our spare parts service, we are always ready to listen.